We fished northwest of Ludington today, setting up in the 59’s & 40’s. The break was down 80 feet. We had 2 to 3 foot waves from the southeast and it was overcast. Our out downs were set at 85 & 95 and the chute was at 115. Our first fish, a big steelhead, came on the 85 down rigger. We had a pair of Beefeater spoons stacked on it and it proved to be our best rigger of the trip. We ended up moving our other out down up to 75 feet and the chute up to 95 feet. We had an 11″ White Crush/Crush Paddle/Pickled Sunshine Action Fly on the chute rigger with a mag glow spoon stacked 10 feet above it. 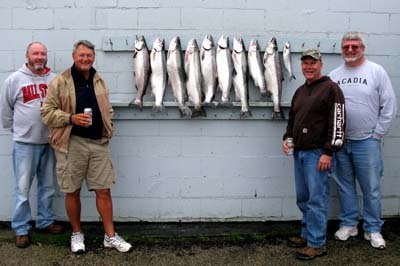 We took one Steelhead on the Paddle and a Coho and another Steelhead on the stack. We didn’t have much diver action. A 10″ Kevin’s Girlfriend Spin Doctor/Froggie Big Water Meat Rig out 300 on a high wire diver went twice. That was it for our divers. A regular Dreamweaver Super Bread spoon on a 350 copper took our biggest Steelhead. A Super Slim Riverside spoon on a 200 copper went twice and a mag Yellow Tail Fuzzy Bear Spoon on a 400 copper went a couple times. We took it out to the 46’s before we turned. Our best action was between the 41’s & 43’s and the downwind troll was much better than the upwind troll.